Hello from the Blizzard of Oz! That’s what the weather people were calling yesterday’s snowstorm. Kind of fitting since we live in Kansas. It was one heck of a blizzard that’s for sure. Tons of snow, wind and bitterly cold temperatures. The wind has made some incredible snow drifts. The drifts make it hard to measure how much snow we actually got, but I’d say it was 8-12 inches where I live. In some parts of the yard the snow is all the way up to the dogs’ bellies. And I have a lab and a chow – not small dogs! I have not been out of the house since Monday evening when I got home from work. Ever since I’ve been on a baking and cooking spree. Something about the cold weather makes me want to get busy in the kitchen. And the fact that I’m stuck in my house and can’t go anywhere anyway. I’ll start with a recipe I made Monday night. 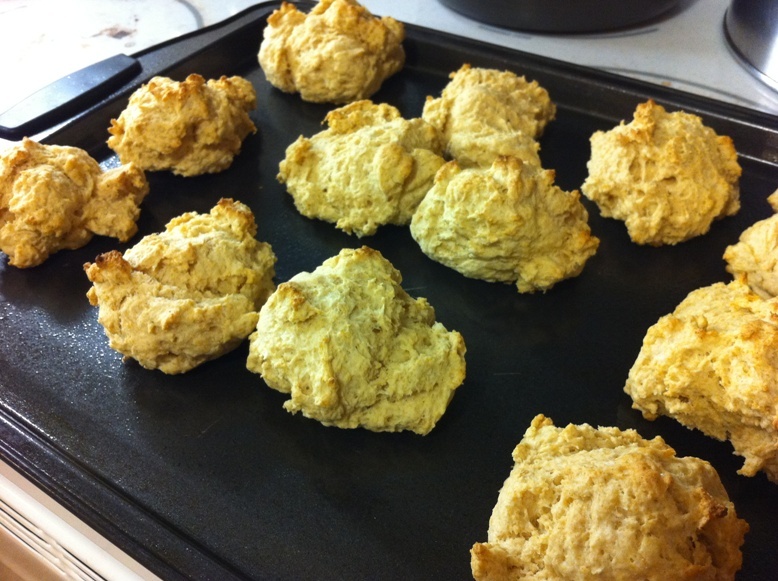 It was actually the second time I’ve made this recipe – homemade drop biscuits. The first time I made them for breakfast and then Monday night I made them as an addition to dinner. Both times they turned out great. 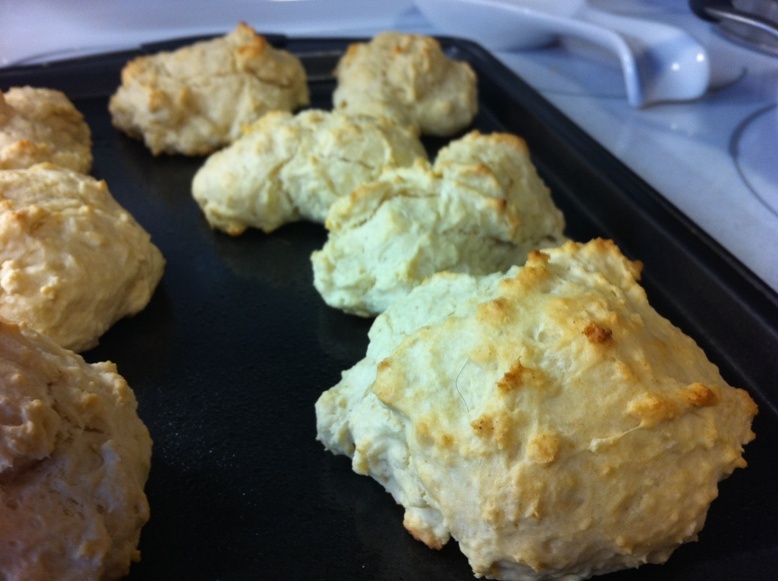 I love these biscuits because they are so easy to make! I’m too lazy to roll out the dough and cut out circles, so that’s why I love drop biscuits. Much less time required. The note on the recipe says it is from the book How It All Vegan! I don’t own this book, so I have no idea if that’s true or not. The recipe is super simple and involves ingredients you probably have on hand right now. However this link doesn’t have much instruction, so I’ll provide a little more guidance here. 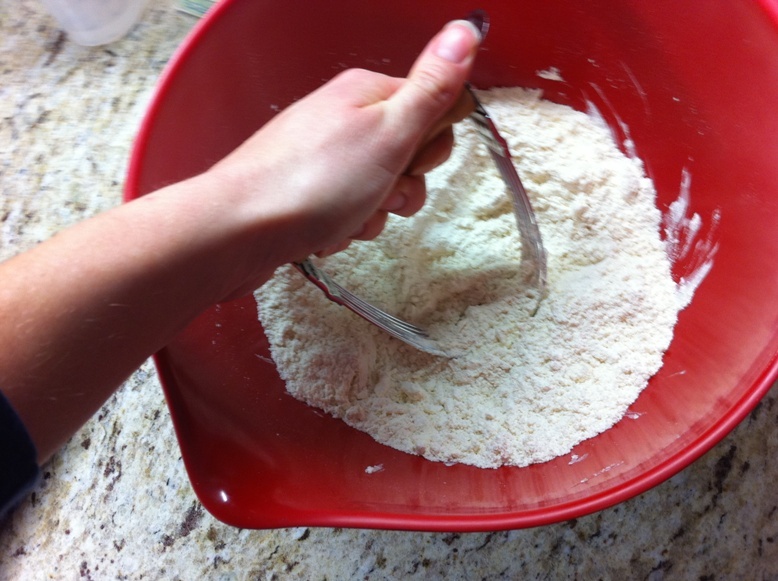 First, in a medium to large bowl, mix all your dry ingredients together – flour, baking powder and salt. Second, cut the butter or margarine into chunks and add chunks to the flour mixture. Note: the butter or magarine should be cold. Now you have to “cut-in” the butter into the flour mixture. To do this I use a tool called a pastry blender. 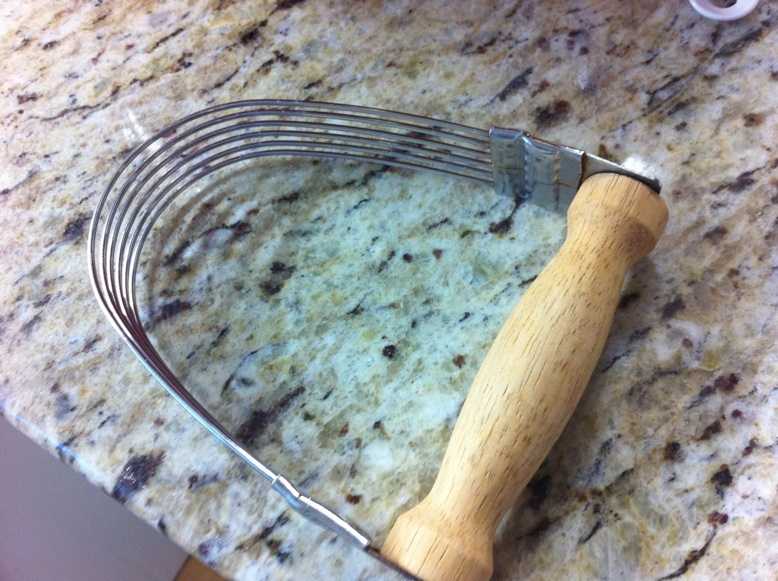 A pastry blender is a pretty handy tool to have in the kitchen for making biscuits and pie crusts. It’s small and doesn’t take up too much space. You could also do this with a fork or a couple knives, but the pastry blender gets the job done faster. All you do is grab this by the handle and mash up the butter into the flour mixture. Some butter will get stuck in the blender, but just knock it out and keep going. Once the butter is cut up into small enough bits, it won’t get caught and you’ll end up with a crumbly-looking dry mixture. Now add the vinegar and 3/4 cup of milk. Stir until combined. I use a wooden spoon as the dough can get a little stiff. If the dough seems dry, add more milk 1 tsp to 1 tbsp at a time. Do not add the entire remaining 1/4 cup all at once. I did that the first time and my dough was way too wet. I had to add more flour. Once dough is nice and combined, it should be stiff and not too wet or too dry. It should form a ball and not cling to the sides of the bowl (for the most part). From here all you have to do is drop the dough by the spoonful onto a cookie sheet and then bake. The size of the biscuits is up to you. The first time I made these I ended up with 8 large biscuits. The second time I had 12 smaller biscuits. Both batches turned out great. Benzo said he thought he liked the second batch with the whole wheat flour better. 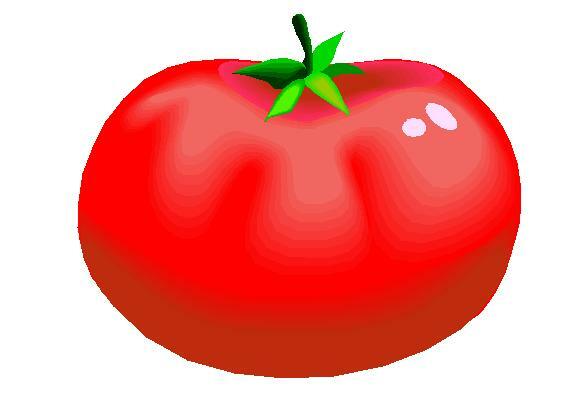 Another note – on Monday night for dinner, Benzo got home a little later than planned. So to keep the biscuits warm I put them in the oven after it was turned off. I do not recommend this. They got a little dried out and were not nearly as good. Once I heated them up in the microwave they were fine. It’s pretty obvious that I really enjoyed this recipe. I expect I’ll be making it often, so I’m going to add it to the Basics tab as a reference. I grew up with drop biscuits and they have a very fond place in my heart! I love them with any meal to be honest. A little butter and honey on top is where it’s at!